This surreal, hallucinatory new release is just around the corner! Recorded on Star’s End at the WXPN studios in Philadelphia, LANDMASS plays like a shapeshifitng bookend to ARC OF PASSION. 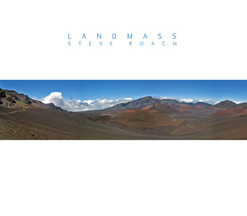 This flow of all-new material morphs and melts its way into an expansive world that feels void of civilization, a world of iconic formations, immense skies and dangerous vistas. pushing beyond the comfort zone…. Star’s End stands as an iconic radio show broadcasting from WXPN in Philadelphia, PA, into the deep hours Saturday night through Sunday morning. Created more than three decades ago by John Diliberto and Steve Pross, Star’s End has been presented by Chuck van Zyl for over 27 years, the last 15 as the sole host. Along with the radio show, Chuck supports the live electronic music scene with the ongoing Gatherings Series of concerts, America’s premier live showcase for electronic artists from around the world. Steve writes: This recording was composed live on the Star’s End radio program at the WXPN studio complex. Drawing from material and themes created exclusively for this performance, the main body of LANDMASS is presented as it occurred with a few artfully placed edits due to the longer duration of the set. Earlier that evening I presented a 90-minute Gatherings concert at St. Mary’s Church. The concert completed, the gear was set up for the second time in a few hours at the WXPN studios a few miles away. With the last cables plugged in as I went on air at 2 AM, the surreal terrain of LANDMASS was about to be discovered. Together we left the base camp of the studio for higher ground and a more rarified air. As I prepared the sounds and sub-structures in the weeks before the event, a strong visual aspect to the music developed. The title LANDMASS and piece titles suggest this clearly. At times it felt almost like a film playing in my mind’s eye as the set unfolded; this was part of the empetus of this experience.